After I spent a bit of time getting to know the stories in my delightful ARC (thank you Grim Oak Press! 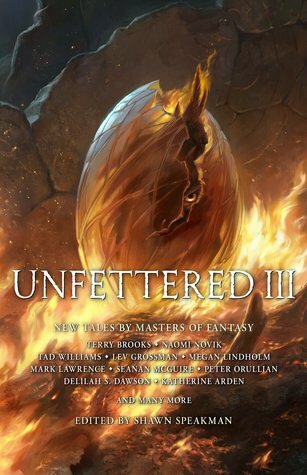 ), I spent a bit more time getting to know the backstory to this anthology, the third in a series of anthologies edited by Shawn Speakman—and let me tell you, there's nothing that more epitomizes the year 2019 than an anthology of top-shelf science fiction and fantasy authors designed as a creative solution to paying down someone's medical debt. I highly recommend taking a peek at the "about" p After I spent a bit of time getting to know the stories in my delightful ARC (thank you Grim Oak Press! ), I spent a bit more time getting to know the backstory to this anthology, the third in a series of anthologies edited by Shawn Speakman—and let me tell you, there's nothing that more epitomizes the year 2019 than an anthology of top-shelf science fiction and fantasy authors designed as a creative solution to paying down someone's medical debt. I highly recommend taking a peek at the "about" page on Grim Oak Press's website, which you can find [ here ], where Speakman's story (and the larger story of the Unfettered series) is spelled out in more detail than I can do justice to here. Suffice it to say, everything behind the scenes (behind the pages?) of this anthology speaks to the humanity and general all-round excellence of the authors involved ... as well as to the sad ultimate truth of (hopefully) late-stage capitalism: when systems like the American health-care system fail you, good people are the ones who are left to pull you out of the fire. Sometimes they may be your last line of defense. And even though Unshuttered was the rare success story of a creative solution gone right, not everyone has access to the kinds of authors that Speakman does, or to the apparatus of publication, or the marketing and promotional gifts required to make a success out of a project like this. Good people, I guess I mean to say, are not a substitute for humane systems of government. I cannot speak to the previous two anthologies, which I have not had the pleasure of finding copies of, but the stories collected in Unshuttered III are representative of a wide range of voices and types and forms and genres. Standouts, in my mind, include Seanan McGuire's "Stripes in the Sunset," Carrie Vaughn's "Sidekick," and Naomi Novik's "Seven." "Stripes of Sunset" punched me in the emotional gut and makes for an excellent companion to de-extinction and "rewilding" narratives like Kim Stanley Robinson's 2312 . "Sidekick" provides a fun companion piece to our global obsession with superhero narratives where the human cost and human collateral is often overlooked. And "Seven" pulls some lyrical moves reminiscent of Ursula K. Le Guin's "The Ones Who Walk Away From Omelas," only with a more positive take on the bedrock of human nature. NEW WHEEL OF TIME SHORT STORY! Problem with anthologies, I am not as invested with all the stories. I do recommend you read it, maybe find a new author, and there was some amazing stories. A standout unexpected to me was the story Sidekick! Did I mention a new WoT story!